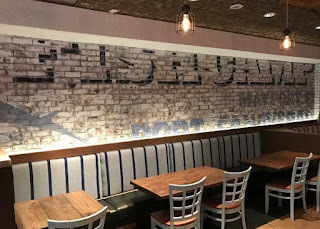 The Fish Camp on Lake Eustis is a newer restaurant to the area, that is serving up some pretty darn good seafood in a hospitable atmosphere that is directly on the lake. 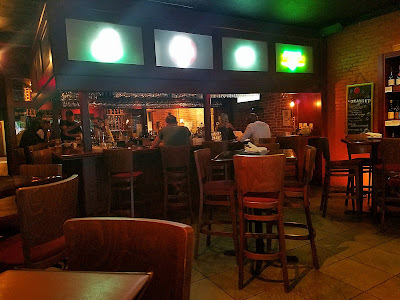 The locals are flocking to this new hotspot, but even if you live in Orlando or any surrounding areas, this place is certainly worth the drive, especially for a Friday night or a weekend visit. The exterior is pretty low key, but that's a good thing, because they do a fine job of selling the whole fish camp vibe. Many patrons have snapped photos of gators resting dockside, wild birds, eagles, owls, you name it, can be seen on a daily basis from the docks surrounding Fish Camp. People who live on Lake Eustis, or are out on a weekend fishing trip or a nature tour can easily pull right up to the boat slips they have outside and go inside the restaurant to grab a bite to eat and a drink or two. The food served here is very seafood and fish oriented, hence the name. The appetizer list starts off with items like Middle Neck Clams, Grouper Nuggets, Old Bay Crab Cake and Groveland Gator Bites. Moving on to entrees, they have Shrimp Scampi over linguini, Grouper Tacos, Shrimp and Grits, Seafood Trio and a Pineapple Marinated Sirloin to name a few. 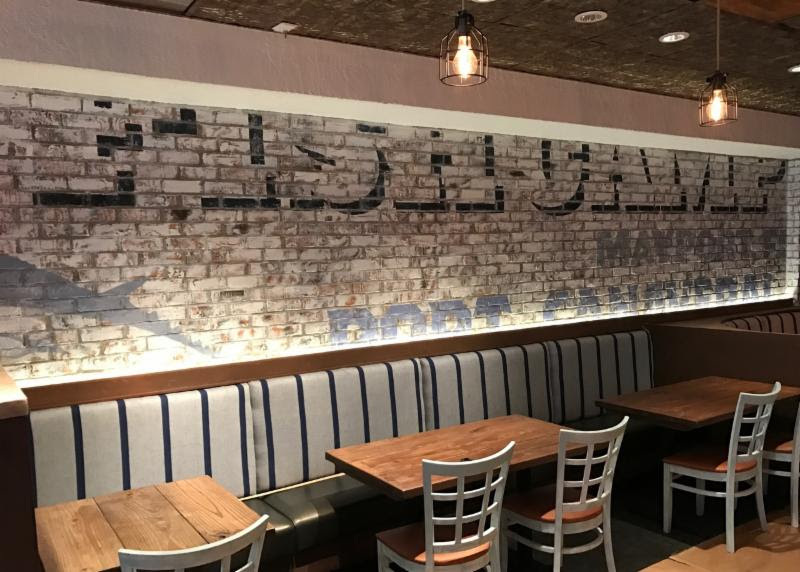 The Bar is nice and cozy at Fish Camp with a laid back atmosphere. Speaking of the bar, I was very pleased to find out that Fish Camp is very dedicated to not only local food sourcing, but also working with local distilleries as well. We did sample and try some very good spirits from Palm Ridge Reserve and Yalaha Bootlegging Co., both of whom are located in Umatilla and Yalaha Florida. The inside dining room is very spacious with plenty of seating, and they also have a nice outside deck area to enjoy the sights and sounds of nature during your visit. We started our evening off with Swamp Cabbage Ceviche that is made with fish and shrimp with lime, roasted corn, hearts of palm, red onion and tomato and is served with homemade tortillas. The flavors going on in this appetizer were pretty impressive with a perfect blend of citrus and spice, and the housemade tortillas really made this dish excell. Everyone has their own interpretation of Ceviche, and I personally really enjoyed this version. The drinks at Fish Camp are pretty impressive as well, and they don’t skimp on the ingredients either. On the left is the Unhinged Anhinga Mojito and The Grand Ol' Osprey old fashioned on the right. Gator Bites can be tough, chewy, or just plain not enjoyable, so when you find some really good ones, it is required to eat every last bite, and that is exactly what we did. The Groveland Gator Bites are breaded pieces of Gator Tail, fried and served with Sriracha Garlic Aioli and a Pineapple Salsa Cruda. These were delicious. The Seafood Trio Tavares is a great way to sample a few things while dining at the Fish Camp. This dish comes with butterflied shrimp, grilled fish of your choice, and a crab cake over a dijon sauce with two sides. We chose blackened grouper for the fish. All of this was phenomenal, and the crab cake here has as much crab as possible with almost no fillers. Everything was fresh and full of flavor, and the dijon sauce went very well with all of the selections plated. They have a variety of sides available here also like Linguini, Wilted Kale, Shaved Brussels Sprouts, Sweet Potato Fries, Corn on the cob, Bacon Cheddar Grits, Salt & Pepper Fries, Side Salad and Hush Puppies. We chose to sample the Bacon Cheddar Grits, Wilted Kale and the Shaved Brussels Sprouts and all of them were quite tasty side selections and really a notch above what one might find at a traditional fish camp type of restaurant. A Redneck Margarita made with Yalaha Bootlegging Moonshine is on the left, and a splash of Palmridge whiskey on the rocks is on the right. I have been to some rather famous locations on Florida’s West Coast and have had some pretty darn good grouper, so I'm always impartial when it comes to grouper, but this is hands down some of the freshest and tastiest grouper that I have had from Orlando to Clearwater. These Fried Grouper Tacos were excellent. They are served with a light drizzle of chili crema and topped with Pico de Gallo salsa. You can order them fried, blackened, or grilled. The Bacon Caramel Cheesecake is pretty ridiculous at Fish Camp. This little slice of heaven is worth the drive over there all by itself. This is a sweet and savory dessert that was a perfect ending to a great visit The Fish Camp in Lake Eustis. The Fish Camp on Lake Eustis is a great place to enjoy some fine seafood, craft cocktails, and warm and friendly service, all with a view and a location that is unmatched in the area. If you are a local, make sure you hit them up. If you live in Orlando like I do, It is certainly worth the drive. Raw Bar Wednesdays start with Fresh Oysters raw or steamed Middleneck Clams for $6/Dozen and Oysters $9.99/Dozen as well as a Pound of Peel n Eat Shrimp for $10.99. Thirsty Thursdays feature $1.99 Margaritas and Martinis with dinner from 4pm to close, Fish Friday is Every Friday with All You Can Eat Fish N’ Chips. They recently started doing a weekend brunch special as well, which would make for a great start to your day of fishing or sightseeing on Lake Eustis. Fish Camp is open Monday to Thursday from 11:00am until 9:00pm and on Friday and Saturday from 11:00am until 10:00pm. Downtown Winter Park has been known as a foodie destination for quite some time, and it's quite the popular spot for Winter Park Locals. With restaurants like Luma and Prato with local celebrity chef Brandon McGlamery, The Coop by John Rivers and a host of other great restaurants that fill up the area, one is sure to find something great to eat. The Parkview once upon a time was known as Eola Wine Company, which was a cool place to grab a glass of your favorite wine, or sample something new, but offered nothing in the way of food. Back in 2015 Eola Wine Company was sold, and the the location occupying 136 S. Park Avenue turned into The Parkview. Chef Brad Holmes is the current executive chef, and he is doing everything in his power to make sure The Parkview gets its place on the map as an official destination for the cool kids and foodies alike that visit Winter Park. Everything here is made using only the finest and freshest ingredients possible, when they are available. Chef Brad is also making sure all of his assistants know the menu inside and out, because he is very big on quality and consistency, and that's a really good thing. The menu here has a big focus on small bites and bar fare, because after all, wine and food go hand in hand. Items like Baked Brie, Baked Gnocchi, Beer Cheese & Pretzels, Confit Chicken Wings, and a truly amazing Truffle Mac & Cheese are great items to enjoy while sampling a flight of wine, or enjoying one of the many specialty craft beers available. The Confit Duck, Pulled Pork and the Roasted Artichoke crostini’s are enough to share, or simply enjoy it all to yourself. Charcuterie Boards and a variety of fresh salads are also plentiful here with assorted meats accompanied with local jam, house cured olives, chef’s butter, grapes, sweet pickled peppers, caper berries and walnuts, and a variety of fresh greens used in the salads. If you require a more complete meal, Chef Brad and The Parkview have you covered there also, with a nice selection of chef’s specials and a flatbread selection that will leave you full and satisfied. Items like Braised Short Rib Wellington, Fresh Catch en Papillote, Roasted Lamb, Roasted Bone Marrow, Thai Curry Mussels and a Confit Duck flatbread are wonderfully delicious and wholesome meals to cure your dinner cravings. The Birdwatcher is a wine flight of crisp white wines featuring wines from Montinore Estate, Font-Mars, Terranoble, and Pazo das Bruxas. If you are not sure what you want, or like, The Parkview has a good selection of flights to choose from. If wine is not your thing, they have an incredible craft beer selection too. Spring Salad was light and refreshing and features field greens, poached pear, dried cherries, smoked bleu cheese, candied walnuts and a champagne vinaigrette. The Roasted Artichoke Crostini is pretty outstanding with roasted artichokes, red pepper pesto, pickled red onions, arugula and Manchego cheese. Truffle Mac & Cheese is quite a popular dish at a lot of restaurants these days, but the one served up at The Parkview is quite spectacular. This is made with smoked Gouda cheese, Crimini mushrooms, Parmesan, Truffle oil and bread crumbs. This is a great dish to share at the table, but one bite into it, and you may try to put it all away yourself. Aside of being beautifully presented, the Roasted Lamb is herb crusted and served with sauteed olives, roasted red peppers, artichoke and spinach, Tzatziki sauce and chili oil for a slight touch of heat on the end. The Fresh Catch en Papillote is a classic French style of cooking in a parchment packet that features fresh fish of the day, and this day it was fresh Yellowtail cooked with crab butter, summer squash, zucchini slaw, lemon and herbs and served along side roasted potatoes, and green bean almandine. This is a very traditional dish, and the flavor was nothing short of extraordinary. Chocolate Mousse with bacon cookies was an off the menu special dessert and it was a wonderful ending to our time at The Parkview. The Parkview still has an incredible selection of wines in its current form, but now they also have an incredible selection of food and craft beers. Since the the transition from Eola Wine Company, they have had a couple of head chefs come through the doors and pretty much build a menu from scratch with a very small kitchen that only has the bare necessities. When you consider this, and the quality of food and wine here, this place is pretty amazing, and Chef Brad is doing an excellent job of adding yet another great dining option to the historic Winter Park area. The Parkview is open on Sunday to Wednesday from 11 am to 12 am, and from Thursday to Saturday from 11 am to 1:45 am. They serve food late here and they also have a really good weekend brunch and happy hour specials with Tuesday Trivia.